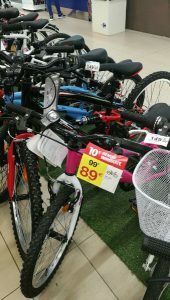 Home > Blog > I need bikes for my children in France. Can you help? We are often asked by clients with children if we have child-size bikes to hire. The answer is: “yes and no”. We don’t have child-specific bikes but we do have adult bikes that fit taller children. The reason we don’t hire little bikes is two-fold: you can buy them so cheaply in France, even right on our doorstep, and we would have to stock such a wide range to suit all sizes to cater for limited demand. 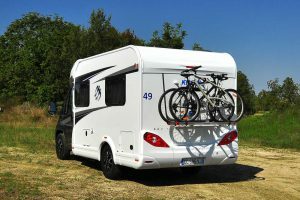 So, we thought we’d take this opportunity to expand a little on where to hire or buy children’s bikes and why it is such a great idea to take them on the back of your motorhome or campervan. (All our vehicles come with bike racks at no additional cost). Bike hire for children is rare in France because the season is mostly limited to July/August, plus, as we mentioned above, you’d have to keep a colossal range of bikes to cater for all children. Most bike rental specialists don’t offer them, though we have found one, Ludisport, based in Maçon, three hours south of our depot. They rent two sizes of children’s bikes (20″ for 6- to 8-year-olds and 24″ for 8- to 11-year-olds) for between €12 and €15 euros per day, depending on how long you rent for. Helmets are extra, at €4 per day. 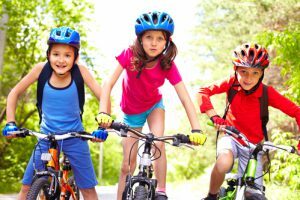 Note that since March 2017, children aged 12 and under have to wear helmets by law when cycling in France. Children’s helmets are available in supermarkets and sports stores for about €10. Our own rental bikes might be suitable for your children, depending on how tall they are. We have hybrid bikes and some smaller, lightweight city bikes (generally used by older folks who can’t lift regular bikes on and off the bike rack. Our hybrids are suitable for anyone from 5’1” (155cm) upwards. Smaller children may find the city bikes OK. If not, the best option, we think, is to purchase a new bike. 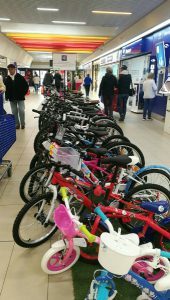 The local hypermarkets sell children’s bikes from around €89 each (see the photos below taken this month). Or try the sports store Decathlon, just 4 kilometres from us, which currently has a couple of models of bikes for about €100. “Cash Converters” (a pawn shop/second-hand thrift shop) in Sens (20 minutes’ drive from the depot) sometimes sells bikes too – but that’s a bit hit and miss as their “stock” is very variable. What to do with the children’s bikes when you leave? At the end of your trip you might be able to sell your bikes back to Cash Converters, but they’ll give you very little for them I expect, so I wouldn’t count on including that return in your holiday budget. However, it’s good to know that there is somewhere you can leave them. Another possibly better idea is to donate your bikes at the end of your trip to Emmaüs – the charity for the homeless in France. You can find the locations where they accept donations, of all sorts of things, here. Why bother? Will the children really get the chance to ride? And finally, why go to all this effort to kit your kids out with bikes? We think France is one of the best countries to cycle in. There are literally hundreds, if not thousands, of kilometres of traffic-free routes in France. If you stay on campsites, which you probably will, you’ll find that they are safe and ideal for the children to race around in. They will want to get up to go buy the morning’s bread and croissants on a bike!